Description: Major religious themes of the Bible, such as election and covenant, are not mentioned in the book of Proverbs. Furthermore, self-interest underlies its motivational system (�you shall behave well, because it will be good for you�). These �selfish� and �secular� features have posed serious ethical and theological challenges for some interpreters, while others have claimed that their presence is only in the eyes of the beholder. After a thorough investigation of the history of Proverbs� interpretation in the nineteenth and twentieth centuries, Zolt�n Schw�b argues that its self-interested and secular nature should not be simply affirmed or dismissed. The question is not whether Proverbs is selfish and secular but in what ways it is selfish and secular and within what conceptual framework one is supposed to interpret these characteristics. In order to construct a proper framework, Schw�b uses such diverse sources as Thomas Aquinas� theological ethics, modern secularization theories, ancient Near Eastern temple ideology, and the theological tradition of God�s incomprehensibility. The result is a reading that simultaneously reflects on the ancient context of the text and the concerns of its readers in a secular world. 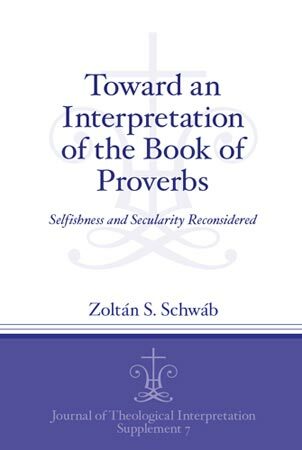 Citation: David Penchansky, review of Zolt�n S. Schw�b, Toward an Interpretation of the Book of Proverbs: Selfishness and Secularity Reconsidered, Review of Biblical Literature [http://www.bookreviews.org] (2014).